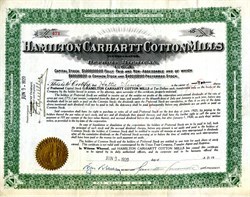 Beautiful stock certificate from the Hamilton Carhartt Cotton Mills issued in 1920. This historic document has an ornate border around it. This item is hand signed by the Company’s Vice President, Hamilton Carhartt Cotton Mills signed by Founder, Hamilton Carhartt and Secretary and is over 93 years old. Carhartt, Inc. is a leading U.S. producer of workwear--overalls, jeans, coveralls, jackets, and other items--favored by those in the construction and farming industries. During the 1990s workwear became fashionable, as popular rap music artists and hip-hop bands started wearing Carhartt clothes. Despite the broader appeal of Carhartt clothing, the company continued to regard its most important customer as the American worker, who preferred Carhartt clothes, even though they were typically priced higher than other work clothes, because they proved durable, comfortable, and easier to clean. In the late 1990s, the company's garments were sold chiefly at smaller retail outlets catering to blue-collar men. However, Carhartt was also available in limited quantities in such department stores as J.C. Penney, Meijer, and Sears. Facing challenges in meeting consumer demand, Carhartt maintained a selective distribution policy in order to handle the growth of the business. The company's founder, Hamilton Carhartt, was born in Macedon Locks, New York, in 1855 and was raised in Michigan and Wisconsin, where his father, Dr. George Carhartt, was a physician and surgeon. Although his family distinguished itself mainly in the learned professions, Hamilton Carhartt had an interest in commercial pursuits. He left school in 1882 to enter the furniture business, first in Grand Rapids, Michigan, and then, in 1884, in Detroit. There Carhartt established a wholesale furniture business under the name Hamilton Carhartt & Co. In 1889, he converted the business from home furnishings into one devoted exclusively to manufacturing apparel for working men. His first products were overalls made of duck--a tightly woven cotton fabric--and denim fabrics for men working on and building the railroads. In 1905 the business was incorporated as Hamilton Carhartt Manufacturer, Inc.; it was reincorporated as Hamilton Carhartt Cotton Mills in 1910. By this time Carhartt had grown to include two mills in South Carolina and Georgia, as well as plants in Atlanta; Detroit; Dallas; San Francisco; Walkerville, Ontario; Vancouver, British Columbia; and Liverpool, England. The Walkerville plant was devoted to the manufacture of gloves. By 1925 Carhartt had established a new plant in Paris and had an office and warehouse in New York City. A third mill was operating in Alabama. Hamilton Carhartt Junior--Manufacturer, a subsidiary specializing in young men's working apparel, had operations in Los Angeles and Philadelphia. The company was producing work clothing, overalls, shirts, hunting wear, pants, and shoes. Founded in 1889, the clothing manufacturer offers a line of rugged overalls, flame-resistant work wear, outerwear, sweatshirts, sportswear, and work pants favored by farmers and blue-collar workers. Its clothes have shown up in such popular movies as The Perfect Storm and The Horse Whisperer. The founder of Carhartt, Hamilton Carhartt, quit school at twelve and started to help out in a fabric shop. His main duty was to sweep the entrance and the street outside the shop. Gradually he worked his way up to becoming a sales assistant and then he went on to be a travelling salesman in Michigan. Then he changed companies and again became a travelling salesman, now of men’s clothes. Hamilton noticed that the most sought-after garment was the workman’s overall, and thus the idea to start producing his own line, in order to settle this need and outside of his regular job, was born. So Carhartt went on to rent an office in an attic, he bought some sawing machines and got started. Unfortunately it proved hard to compete with the so-called ‘sweat-shops’, as people generally didn’t care under which conditions their clothes were made. He found his niche with the railway workers, who were keen to have their work clothes made by hand. He carefully made the effort to find out what these workers really needed - something that nobody had did before him. The business grew and after a year he chose to quit the travelling and to concentrate only on his business. Today Carhartt is one of our most beloved labels. Through Carhartt Europe the clothes have been adapted to suit the European market. Here they sponsor sports like BMX, skate and snowboarding as well as different kinds of art activities. The American emphasis is still on the production of workwear, and in the US the sponsorship goes to genuine American traditions.